James Weaver, a member of the Old Order Mennonite community and Benuel Riehl, a member of the Old Order Amish community discuss the similarities and differences between their religious groups. This moderated question and answer session is meant to clarify the common misconceptions that outsiders may have about the Old Order cultures. Snow date is February 29. Sponsored by The Pennsylvania German Cultural Club, Rohrbach Library and the late Dr.Arnold Newman, in conjunction with the Pennsylvania German Cultural Heritage Center at Kutztown University. Amish and Old Order Mennonites are neighbors in many places (communities in Pennsylvania, Indiana, Ontario to name a few) and have many similarities as well as distinguishing traits. I’m looking forward to this event which should be a great format for learning more about both groups. James and Ben I think will both be excellent “cultural guides” for the evening. I had the pleasure of meeting James last summer and have known Ben for some time. Event moderator Dr. Rob Reynolds is accepting questions for James and Ben, so if you have any that you think would be good let us know and I will pass on the best ones. My thanks to PA German Cultural Club President Rhonda Miller for the info and invitation to this event. This also reminds me that we are due for another Amish question-and-answer installment here on the blog, so stay tuned. And if you make it to Kutztown for the talk, be sure to flag me down and say hello! I would love for you or someone else to post some the major differences following the discussion. Should be an intersting discussion. Just a little far to go from NC, unfortunately. I wonder if it might be recorded? St. Mary’s County, Maryland is home to both Old Order Amish and Mennonite communities. They both drive buggies though the Amish use the gray topped like Lancaster County and the Mennonites use black. Also, their clothing is similar but differs too. The Mennonites ride bicycles while the Amish use scooters. The Amish live in the Mechanicsville/Charlotte Hall area while the Mennonites live in the Loveville area about 10 or so miles farther south into the county. I will look forward to your observations and answered questions. I grew up near this area in Maryland. My wife and I are leaders of a Christian Church in the UK. We would like to travel to Ontario this Summer to see relatives in Niagra, but also to try and spend time living and working with an Amish or Mennonite family. We would love to work with a family and have the chance to discuss our relative experiences, and would be happy to pay our way. We appreciate this might be difficult but so much more rewarding than simply visiting the area, as we have done before. If anyone is able to provide a contacts or a means to do this we’d be most grateful. One question I have is about middle names. About 50-75 years ago, the Amish practice in Indiana was for a child’s middle initial to be the same as the first initial of the father. The plainer Mennonite’s practice in Pennsylvania was for the child’s middle initial to be the same as the first initial of the mother’s maiden name. I don’t know to what extent that is still followed today. Was the middle initial because of the state where they lived, or because they were Mennonite or Amish? Maybe we would have to ask an Indiana Old Order Mennonite, or a Pennsylvania Amish. Mennonites have the tradition of using the mother’s maiden name as the children’s middle name. Yeah, all the children have the same middle name. 🙂 This tradition may be slipping in the current generation. But it was alive and well in the generation who are now in their 30s and 40s. The Amish dont seem to have that tradition, although some may do that. One of Moses Horning Granddaughters lives near me, when i discovered this I went to talk to her and asked if the story was true about Moses Horning passing out during the lottery and all the controversy that took place during the time, and she assured me it was. I am probably going to go to this. I missed the other one last week when Donald Kraybill spoke because my wife and I were both sick. This is only about a 30 minute drive for me. I would absolutely love to go, but sadly, cannot, so I hope Erik that you’ll do a nice piece on it afterwards. Of all the years I’ve gone up to Lancaster, I never until recently knew about or even noticed the difference between the Amish and OO Mennonites there. See what an education this site has given us? Now I can readily spot the difference and even know what sections the OO Mennonites live in. The first question that comes to mind is, why don’t the OO Mennonite men have to grow a beard? I see them with their families and in their black buggies and on bicycles and none of them have a beard. Also, is it true that the OO Mennonites go to a different church building to worship every Sunday, as opposed to the Amish who worship at each other’s homes every other Sunday? And lastly, why do the OO Mennonite men wear a sort of black vinyl Fedora style hat instead of the flat black or straw hats like the Amish men wear? Thanks Erik, and look forward to the answers. There’s no way I’d be able to make this VERY interesting-sounding event, and like others here, I wish it could be recorded. If not, and I doubt it would/could be from the O/O side, you know your assignment, Erik! The questions posed so far are of interest, especially the one about middle initials. Where did that start—here in the U.S., or back in Europe? I wish there were some sort of detailed map of Amish & Mennonite areas throughout North America with icons indicating, “black, uncovered buggies,” or “women use prints for their dresses” or “beards for married men, only” or whatever the case may be. It would make it a little simpler (and at the same time, illustrate the diversity/differences within each individual Amish or Mennonite group/church district/area. Can’t wait to learn the outcome of this moderated discussion! POST AN ARTICLE ON THIS PLEASE!! Interesting subject as usual. Sorry for me Pennsylvania is not a hop skip and jump from Illinois; otherwise I would attend. I agree with all of the above comments. I am truly interested in middle names that Linda also wrote. I’m been kept up many long nights with my Mennonite ancestors regarding names and middle names. I’m finding my ancestors have named many of their children names in the Bible and also after their grandfathers etc. Many of the names though do not have middle names. I have found middle initials. It has been frustrating at times to research of whom belongs to whom when names are repeated. I apologize TO ALL of my previously posted comment title. It seems my computer was possessed at the time of the title. Here again, old fashioned hand writing would not permit this. sorry that’s a bad goof!! To everyone who asked we will try to have a little something on this and try to share at least a few highlights. I think it will be worth coming though if you are able! Unfortunately, I’m nowhere nearby… but I heartily applaud the idea of such an event. It would be fascinating to attend one. 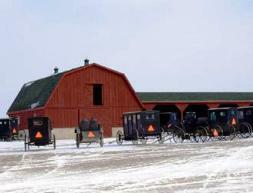 The Old Order Mennonites in our area are extremely conservative: steel-wheels on black buggies, nothing with wheels for play/transportation (like bikes/scooters) except for wagons, because of their usefulness; no inside plumbing (an indoor water pump is ok), full coverage capps, large black bonnets for “away from home,” and no motors of any kind. The nearest Swartzentrubers will use small stationary motors. No reflective tape on their buggies, but the O.O. Mennonites don’t mind lighting their buggies well with battery powered lights. I’m thankful for that. I would like to know where the Old Order Mennonite settlement is also. I live in Berks County and I’m guess it’s up near the Kutztown area. the church compared to the retention rate of Old Order Amish youth? Now that I’ve dwelled into my Mennonite genealogy I find it fascinating. Thank you Marcus of the info on the web. Now need to locate descendant books. Al from Ky. had some interesting questions. I also would like to know where the Old Order Mennonite settlement is located in Berks. Have many ancestors from Berks. Most of the Amish and Mennonite from Europe came to America sailed into Philadelphia and settled in Berks county first. Linda, my dad was born in Coles county Arthur, Illinois.